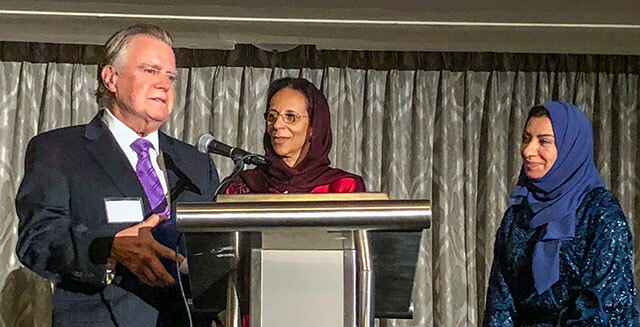 Her Excellency Hunaina Al-Mughairy, Ambassador of Oman to the United States and Vice-Dean of the Arab Ambassadors to the United States, and Ms. Hanan Al Kindi, representing the Sultanate’s Ministry of Information, spoke of Dr. Anthony’s record of public service. She highlighted in particular the ways in which he has worked to strengthen and expand relations with America’s Arab friends, allies, and strategic partners. She acknowledged especially his efforts spanning five decades to educate two important American constituencies. One has involved U.S. civilian and defense leaders. For these, Dr. Anthony’s continuing focus has been on emphasizing the extraordinary importance of the Sultanate of Oman’s role in regional and global affairs. The other has highlighted that segment of America’s youth who represent the emerging generation of tomorrow’s Arabists. With these, the emphasis has been on producing leaders who are educated and trained in how best to strengthen and expand the overall U.S.-Arab relationship. An Omani flag flies off the back of a dhow traversing the waters of the Hormuz Strait, the world’s most strategically vital waterway. Photo: Dr. John Duke Anthony. In accepting the recognition, Dr. Anthony stated that nothing he has achieved would have been possible without the steadfast support of the National Council’s Board of Directors, management, and staff, together with leaders of the many entities that identify with the Council’s strategic vision and educational mission. In adding that he has visited the Sultanate 51 times since 1971, Dr. Anthony said that he is but one among countless American and other specialists who have long been aware and appreciative of His Majesty Sultan Qaboos’s leadership. He singled out how Qaboos’s indefatigable efforts have made a defining difference in the effectiveness of behind-the-scenes-diplomacy with regard to Afghanistan, Iran, Iraq, Somalia, Yemen, and the ongoing quest to bring about a just, lasting, and comprehensive peace between Israel and the Palestinians as well as Syrians whose lands Israel occupies and whose resources it exploits. (In October 1998, the National Council, in association with the U.S. Military Academy, the Air Force Academy, Harvard University, the Kennedy Center, and 30 other American educational institutions, presented H.M. Sultan Qaboos the first-ever International Peace Award to an Arab Head of State). Dr. Anthony pointed out that His Majesty has simultaneously worked effectively to help make the Sultanate an effective defense cooperation partner, and a world-class destination for cultural tourism and state-of-the-art industrial infrastructure. [Left] Dr. Anthony with H.E. Ambassador Al-Mughairy. [Right] A sterling silver coffee pot crafted by artisans in the country’s cultural capital in Nizwa, a symbol of Oman’s superb artisanry and handicrafts, as presented to Dr. Anthony at the Iftar celebration. 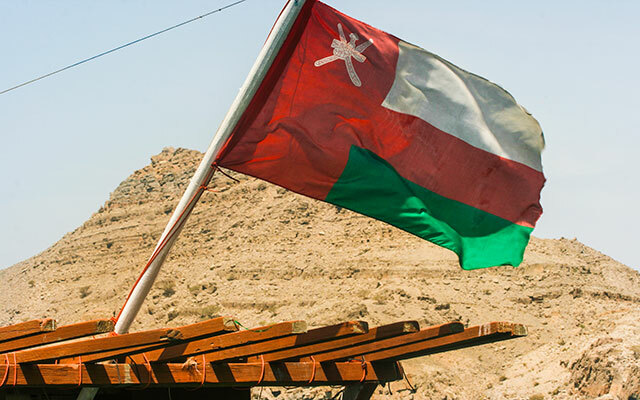 Dr. Anthony noted that in 1833, Oman was the first Arab nation to establish diplomatic relations with the United States, and in 1840, it was the first to have an accredited diplomat in the U.S. In addition, from a modest beginning dating from when Sultan Qaboos became the Ruler in 1970, the number of Omani students currently studying at American institutions of higher education has grown to a record 4,000 at the present time. Dr. Anthony expressed his appreciation to Ambassador Al-Mughairy, Ms. Al Kindi, and the team they lead at the Omani Embassy for the special honor. Alongside Dr. Anthony, former District of Columbia Mayor Adrian Fenty was also recognized for his extraordinary service and contributions to the nation’s capital. About the National Council on U.S.-Arab Relations: Founded in 1983 and based in Washington, DC, the National Council is an American non-profit, non-governmental, educational organization. Among the Council’s eleven programs, projects, events, and activities dedicated to improving American knowledge and understanding of the Arab world are flagship education, training, and leadership development programs for the emerging generation of young Americans and Arabs that seek to strengthen, expand, and improve the relations between the American and Arab peoples. Information about the Council can be found at ncusar.org. This entry was posted in John Duke Anthony, NCUSAR.